Front row l to r: Lee Elliot, Floyd Hooks, D.Y. Dunn, Harold Hines, Will Saddler, Vernon Dedham and Leslie Schultz. 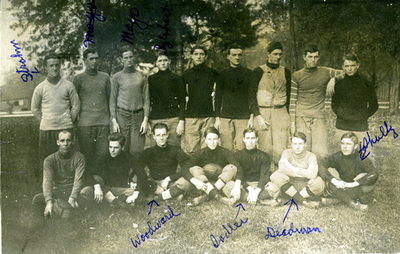 Second row l to r: Victor Strahm, Pierce Guerin, John Mayo, Royse Iglehart, Ben Mitchell, V.W. [Vivian] Wallis, Leslie Woodrum, ? Kirby and Dudley Crafton. If you recognize this photo and can help identify the people in it, please send feedback - above. The first game was played against Elizabethtown High School, the final score: WKU 20, Etown 0. How do you like the looks of these roughs?